William Lewis Cabell was born in Virginia in 1827. AFter graduating from West Point in 1850, Cabell served in the 7th U.S. Infantry in Indian Territory and took part in the Mormon campaign in 1858.. He resigned his commission in 1861 to enter the Confederate service. 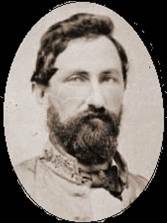 He was at the First Battle of Manassas in the role of Chief Quartermaster of Beauregard’s army. Cabell went west in early 1862, first as a quartermaster, but then became a line officer. He led Texas and Arkansas troops in battles in Mississippi and Arkansas, ultimately heading a division of cavalry. He was captured during Price’s Expedition, at the Battle of Mine Creek in October, 1864. Cabell died in Dallas, Texas in 1911, having made his home there after the war. He served four terms as Mayor of Dallas, and also was U. S.Marshall for the Northern District of Texas.